•Clean cabinets as needed with a mild detergent or with soap and water (use sparingly) and dry well using a lint-free cloth for both washing and drying. •Wipe up spills, splatters and water spots as they occur, keeping cabinets and countertop surfaces dry. 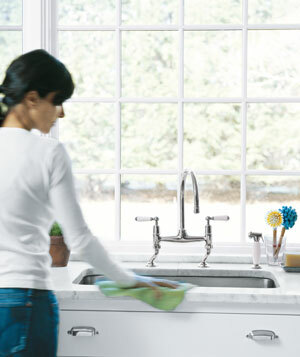 •Give special attention to areas near the sink and dishwasher that come in contact with moisture. •Use cleaners and polishes designed for wood cabinets and clean all surfaces as needed. Do not use abrasive cleaners, scouring pads or powdered cleaners. These materials may penetrate the cabinet finish allowing moisture to enter and cause deterioration. • Do not use aerosol sprays containing silicones or paste waxes. • Do not leave wet cloths on or near cabinets. • Do not allow oven cleaners or other caustic cleaners to touch the cabinets. • Follow instructions carefully for self-cleaning ovens and other kitchen appliances around cabinets. Most problems can be prevented by wiping up any spills as soon as they occur. Follow these first aid suggestions for common household accidents. When removing a spot, begin at the outer edge and work toward the middle to prevent the spot from spreading. Clean cabinets as needed with a mild detergent or with soap and water (use sparingly) and dry well using a lint-free cloth for both washing and drying. Use cleaners and polishes designed for wood cabinets and clean all surfaces as needed. Rub grease, lipstick, crayon or oil with a damp cloth. Use cleaners and polishes designed for wood cabinets and clean all surfaces as needed. Apply a plastic bag filled with ice on top of the deposit until it is brittle enough to crumble off. Use cleaners and polishes designed for wood cabinets and clean all surfaces as needed. Most nicks and dents can be repaired with a Cabinetry Care Kit. Rub the area with fine sandpaper until you have removed the scratch or burn. Re-stain with Armstrong Cabinets color matched Touch-up Stain and apply a light coat of Clear Sealer Finish. Use cleaners and polishes designed for wood cabinets and clean all surfaces as needed. Vinyl wrapped frames give perfect door-to-frame color match. These rigid frames increase the durability of the cabinets and make them easier to clean. Follow the above wood cabinet care guidelines for your laminate and thermofoil door styles (except for cleaners/polishes specifically made for wood). Acrylic Adhesive Caulk and plastic Seam Fillers are available for these cabinet types in different finishes. Always treat your cabinets as you would fine furniture.